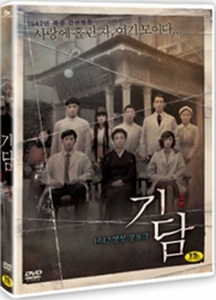 'Gidam' is a horror movie about a mysterious incident that took place at the Gyeongseong Ahnsaeng Hospital in 1942. The film has attracted a large number of moviegoers with its fresh story line, scenes that appeal to the aesthetic sense and the underlying sadness behind the prevailing horror. �In a modern hospital in 1941, doctors witness weird events and learn DEATH is the sole healer.� In 1979, Dr. PARK receives an old photo album from his twenties in 1941 when mysterious things befell him and his colleagues. PARK was bound by his parents to marry a girl whom he never met, but fell in love with a dead woman who happened to be his arranged marriage. Meanwhile, a little girl who was apparently the only survivor a car accident was haunted by ghosts every night. After two doctors (a married couple) involved in these two stories return to their hospital from Tokyo, a series of serial murders occurs around them.